Principles Laid Down in Conferences. Relation to the Oral Law. Symbolic Views of S. Hirsch. Verein der Reformfreunde of Frankfort. Reform in the United States. 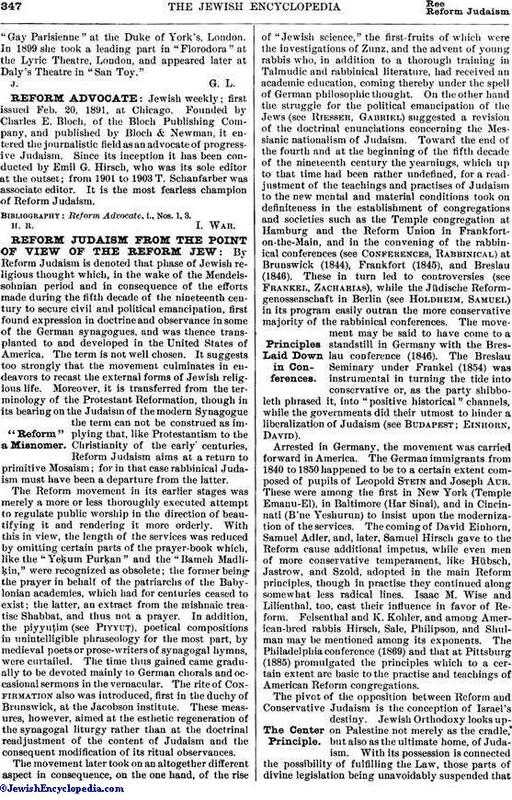 By Reform Judaism is denoted that phase of Jewish religious thought which, in the wake of the Mendelssohnian period and in consequence of the efforts made during the fifth decade of the nineteenth century to secure civil and political emancipation, first found expression in doctrine and observance in some of the German synagogues, and was thence transplanted to and developed in the United States of America. The term is not well chosen. It suggests too strongly that the movement culminates in endeavors to recast the external forms of Jewish religious life. Moreover, it is transferred from the terminology of the Protestant Reformation, though in its bearing on the Judaism of the modern Synagogue the term can not be construed as implying that, like Protestantism to the Christianity of the early centuries, Reform Judaism aims at a return to primitive Mosaism; for in that case rabbinical Judaism must have been a departure from the latter. The Reform movement in its earlier stages was merely a more or less thoroughly executed attempt to regulate public worship in the direction of beautifying it and rendering it more orderly. With this in view, the length of the services was reduced by omitting certain parts of the prayer-book which, like the "Yeḳum Purḳan" and the "Bameh Madliḳin," were recognized as obsolete; the former being the prayer in behalf of the patriarchs of the Babylonian academies, which had for centuries ceased to exist; the latter, an extract from the mishnaic treatise Shabbat, and thus not a prayer. In addition, the Piyyuṭim (see PiyyuṬ), poetical compositions in unintelligible phraseology for the most part, by medieval poets or prose-writers of synagogal hymns, were curtailed. The time thus gained came gradually to be devoted mainly to German chorals and occasional sermons in the vernacular. The rite of Confirmation also was introduced, first in the duchy of Brunswick, at the Jacobson Institute. These measures, however, aimed at the esthetic regeneration of the synagogal liturgy rather than at the doctrinal readjustment of the content of Judaism and the consequent modification of its ritual observances. The movement later took on an altogether different aspect in consequence, on the one hand, of the rise of "Jewish science," the first-fruits of which were the investigations of Zunz, and the advent of young rabbis who, in addition to a thorough training in Talmudic and rabbinical literature, had received an academic education, coming thereby under the spell of German philosophic thought. On the other hand the struggle for the political emancipation of the Jews (see Riesser, Gabriel) suggested a revision of the doctrinal enunciations concerning the Messianic nationalism of Judaism. 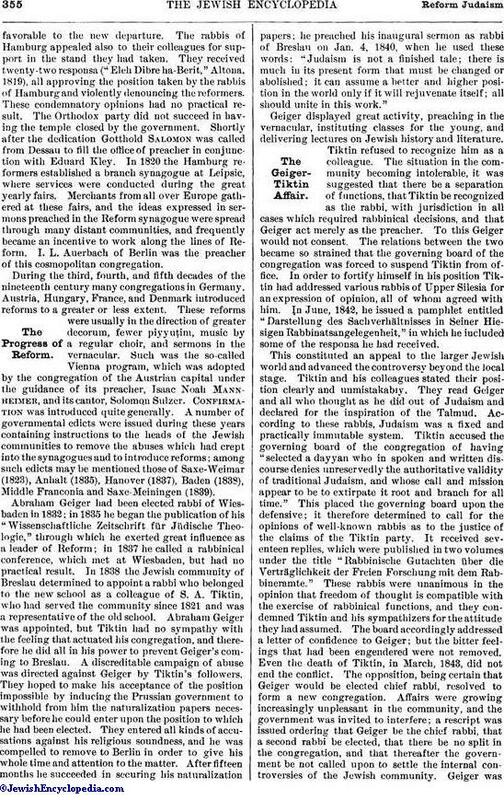 Toward the end of the fourth and at the beginning of the fifth decade of the nineteenth century the yearnings, which up to that time had been rather undefined, for a readjustment of the teachings and practises of Judaism to the new mental and material conditions took on definiteness in the establishment of congregations and societies such as the Temple congregation at Hamburg and the Reform Union in Frankfort-on-the-Main, and in the convening of the rabbinical conferences (see Conferences, Rabbinical) at Brunswick (1844), Frankfort (1845), and Breslau (1846). These in turn led to controversies (see Frankel, Zacharias), while the Jüdische Reform-genossenschaft in Berlin (see Holdheim, Samuel) in its program easily outran the more conservative majority of the rabbinical conferences. The movement may be said to have come to a standstill in Germany with the Breslau conference (1846). The Breslau Seminary under Frankel (1854) was instrumental in turning the tide into conservative or, as the party shibboleth phrased it, into "positive historical" channels, while the governments did their utmost to hinder a liberalization of Judaism (see Budapest; Einhorn, David). Arrested in Germany, the movement was carried forward in America. The German immigrants from 1840 to 1850 happened to be to a certain extent composed of pupils of Leopold Stein and Joseph Aub. These were among the first in New York (Temple Emanu-El), in Baltimore (Har Sinai), and in Cincinnati (B'ne Yeshurun) to insist upon the modernization of the services. The coming of David Einhorn, Samuel Adler, and, later, Samuel Hirsch gave to the Reform cause additional impetus, while even men of more conservative temperament, like Hübsch, Jastrow, and Szold, adopted in the main Reform principles, though in practise they continued along somewhat less radical lines. Isaac M. Wise and Lilienthal, too, cast their influence in favor of Reform. Felsenthal and K. Kohler, and among American-bred rabbis Hirsch, Sale, Philipson, and Shulman may be mentioned among its exponents. The Philadelphia conference (1869) and that at Pittsburg (1885) promulgated the principles which to a certain extent are basic to the practise and teachings of American Reform congregations. The pivot of the opposition between Reform and Conservative Judaism is the conception of Israel's destiny. Jewish Orthodoxy looks upon Palestine not merely as the cradle, but also as the ultimate home, of Judaism. With its possession is connected the possibility of fulfilling the Law, those parts of divine legislation being unavoidably suspended thatare conditioned by the existence of the Temple and by the occupation of the Holy Land. Away from Palestine, the Jew is condemned to violate God's will in regard to these. God gave the Law; God decreed also Israel's dispersion. To reconcile this disharmony between the demands of the Law and historically developed actuality, the philosophy of Orthodoxy regards the impossibility of observing the Law as a divine punishment, visited upon Israel on account of its sins. Israel is at the present moment in exile: it has been expelled from its land. The present period is thus one of probation. The length of its duration God alone can know and determine. Israel is doomed to wait patiently in exile, praying and hoping for the coming of the Messiah, who will lead the dispersed back to Palestine. There, under his benign rule, the Temple will rerise, the sacrificial and sacerdotal scheme will again become active, and Israel, once more an independent nation, will be able to observe to the letter the law of God as contained in the Pentateuch. Simultaneously with Israel's redemption, justice and peace will be established among the dwellers on earth, and the prophetic predictions will be realized in all their glories. At present Israel must maintain itself in a condition of preparedness, as redemption will come to pass in a miraculous way. That its identity may not be endangered, Israel must preserve and even fortify the walls which the Law has erected around it to keep it distinct and separate from the nations. The memories of and yearnings for Palestine must be strengthened even beyond the requirements of the written law. The Law itself must be protected by a "hedge." The ceremonial of the Synagogue, regulated by the Law as understood in the light of rabbinical amplifications and interpretations, is both a memento and a monition of the Palestinian origin and destiny of national Israel, while life under the Law necessarily entails the segregation of Israel from its neighbors. Reform conceives of the destiny of Israel as not bound up in the return to Palestine, and as not involving national political restoration under a Messianic king with the Temple rebuilt and the sacrificial service reinstituted. It is true, many of the commandments of the Torah can not be executed by non-Palestinian Israel. Yet, despite this inability to conform to the Law, Israel is not under sin (the Paulinian view). It is not in exile ("galut"). Its dispersion was a necessary experience in the realization and execution of its Messianic duty. It is not doomed to wait for the miraculous advent of the Davidic Messiah. Israel itself is the Messianic people appointed to spread by its fortitude and loyalty the monotheistic truth over all the earth, to be an example of rectitude to all others. Sacrifices and sacerdotalism as bound up with the national political conception of Israel's destiny are not indispensable elements of the Jewish religion. On the contrary, they have passed away forever with all the privileges and distinctive obligations of an Aaronic priesthood. Every Jew is a priest, one of the holy people and of a priestly community appointed to minister at the ideal altar of humanity. The goal of Jewish history is not a national Messianic state in Palestine, but the realization in society and state of the principles of righteousness as enunciated by the Prophets and sages of old. Therefore Reform Judaism has (1) relinquished the belief in the coming of it personal Messiah, substituting therefor the doctrine of the Messianic destiny of Israel, which will be fulfilled in a Messianic age of universal justice and peace. (2) Reform Judaism disregards consciously, not merely under compulsion, all Pentateuchal laws referring to sacrifices and the priesthood or to Palestine ("miẓwot ha-teluyot ba-areẓ"). It eliminates from the prayer-book all references to the Messiah, the return to Palestine, and the restoration of the national sacerdotal scheme. It ceases to declare itself to be in exile; for the modern Jew in America, England, France, Germany, or Italy has no cause to feel that the country in which he lives is for him a strange land. Having become an American, a German, etc., the Jew can not pray for himself and his children that he and they may by an act of divine grace be made citizens of another state and land, viz., national Israel in Palestine. (3) Reform Judaism relinquishes the dogma of the Resurrection, involved in the Jewish national Messianic hope (see Messiah; Pharisees) that at the final advent of the Messiah all the dead will rise in Palestine, and eliminates from the prayer-book all references to it. The foregoing shows that Reform was never inspired by the desire to return to Mosaism. Mosaism certainly presupposes the Levitical institutionalism of Judaism; and it is nomistic, insisting on the eternally binding character and the immutability of the Law. Reform Judaism ignores and declares abrogated many of the laws of Mosaism. Its theory of Revelation and of the authoritative character of Scripture must of necessity be other than what underlies Orthodox doctrine and practise. According to Orthodox teaching, God revealed His Law on Mount Sinai to Moses in two forms, (1) the written law ("Torah shebi-ketab"), and (2) the oral law ("Torah shebe-'al peh"). According to Mendelssohn and all rationalists of the "Aufklärung" philosophy, there was no need for the revelation of religion, human reason being competent to evolve, grasp, and construe all religion verities. Judaism is, however, more than a religion. It is a divine legislation, under which the Jew qua Jew must live. Human reason could not have evolved it nor can it now understand it. It is of "superrational," divine origin. It was miraculously revealed to Israel. The Jew need not believe. His religion, like every rational religion, is not a matter of dogma. But the Jew must obey. His loyalty is expressed in deed and observance. This Mendelssohnian position was undermined, as far as the oral part of revealed legislation was concerned, by the investigations into the historical development of "tradition," or Talmudic literature, brilliantly carried to definite and anti-Mendelssohnian results by Zunz and his disciples. The oral law certainly was the precipitate of historical processes, a development of and beyond Biblical, or evenPentateuchal, Judaism. Judaism, then, was not a fixed quantity, a sum of 613 commandments and prohibitions. The idea of progress, development, historical growth, at the time that the young science of Judaism established the relative as distinguished from the absolute character of Talmudism and tradition, was central in German philosophy, more clearly in the system of Hegel. History was proclaimed as the self-unfolding, self-revelation of God. Revelation was a continuous process; and the history of Judaism displayed God in the continuous act of self-revelation. Judaism itself was under the law of growth, and an illustration thereof. Talmudic legalism certainly was a product of the Talmudic period. It was not originally inherent in Judaism. It must not be accepted as eternally obligatory upon later generations. But was Biblical law, perhaps, the original, divinely established norm and form of Judaism, and, as such, binding upon all subsequent generations? If it was, then Reform Judaism, ignoring post-Biblical development and tradition, was identical with Karaism; and, furthermore, its omission of all reference to sacerdotal and sacrificial institutions, though these form an integral part of the Mosaic law and revelation, is in violation of the assumption that Judaism is Law, which Law divinely revealed is the Pentateuch. This was the dilemma with which Reform theologians were confronted. This was an inconsistency which, as long as Judaism and Law were interchangeable and interdependent terms, was insurmountable. To meet it, a distinction was drawn between the moral and the ceremonial laws, though certainly the Torah nowhere indicates such distinction nor discloses or fixes the criteria by which the difference is to be established. God, the Law giver, clearly held the moral and the ceremonial to be of equal weight, making both equally obligatory. Analysis of the primitive scheme in connection with the possible violation of the precepts, tends to prove that infractions of certain ceremonial statutes were punished more severely (by "karet" = "excision") than moral lapses. Nor could the principle be carried out consistently. Reform Judaism retained the Sabbath and the other Biblical holy days, circumcision, and in certain circles the dietary laws. Were these not ceremonial? What imparted to these a higher obligatory character? In this artificial distinction between the moral and the ceremonial content of the divinely revealed law the influence of Kantian moralism is operative. Holdhelm, to escape this inconsistency, urged as decisive the distinction between national and religious or universal elements. The content of revelation was two-fold—national and universal. The former was of temporary obligation, and with the disappearance of state and nation the obligatory character ceased; but the universal religious components are binding upon religious Israel. While this criterion avoided many of the difficulties involved in the distinction between ceremonial and moral, it was not effective in all instances. The sacrificial scheme was religious, as Einhorn remarked when criticizing Holdheim's thesis, and still Reform ignored its obligatory nature. Nor could Judaism be construed as a mere religion, a faith limited by creedal propositions. Samuel Hirsch approached the problem from the point of view of the symbolist. With his master Hegel, he regarded history as the divine process of revelation. 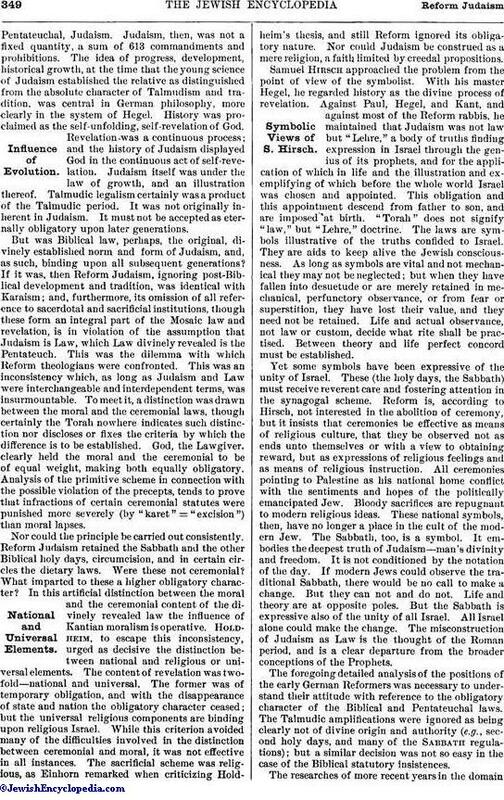 Against Paul, Hegel, and Kant, and against most of the Reform rabbis, he maintained that Judaism was not law but "Lehre," a body of truths finding expression in Israel through the genius of its prophets, and for the application of which in life and the illustration and exemplifying of which before the whole world Israel was chosen and appointed. This obligation and this appointment descend from father to son, and are imposed at birth. "Torah" does not signify "law," but "Lehre," doctrine. The laws are symbols illustrative of the truths confided to Israel. They are aids to keep alive the Jewish consciousness. As long as symbols are vital and not mechanical they may not be neglected; but when they have fallen into desuetude or are merely retained in mechanical, perfunctory observance, or from fear or superstition, they have lost their value, and they need not be retained. Life and actual observance, not law or custom, decide what rite shall be practised. Between theory and life perfect concord must be established. Yet some symbols have been expressive of the unity of Israel. These (the holy days, the Sabbath) must receive reverent care and fostering attention in the synagogal scheme. Reform is, according to Hirsch, not interested in the abolition of ceremony, but it insists that ceremonies be effective as means of religious culture, that they be observed not as ends unto themselves or with a view to obtaining reward, but as expressions of religious feelings and as means of religious instruction. All ceremonies pointing to Palestine as his national home conflict with the sentiments and hopes of the politically emancipated Jew. Bloody sacrifices are repugnant to modern religious ideas. These national symbols, then, have no longer a place in the cult of the modern Jew. The Sabbath, too, is a symbol. It embodies the deepest truth of Judaism—man's divinity and freedom. It is not conditioned by the notation of the day. If modern Jews could observe the traditional Sabbath, there would be no call to make a change. But they can not and do not. Life and theory are at opposite poles. But the Sabbath is expressive also of the unity of all Israel. All Israel alone could make the change. The misconstruction of Judaism as Law is the thought of the Roman period, and is a clear departure from the broader conceptions of the Prophets. The foregoing detailed analysis of the positions of the early German Reformers was necessary to understand their attitude with reference to the obligatory character of the Biblical and Pentateuchal laws. The Talmudic amplifications were ignored as being clearly not of divine origin and authority (e.g., second holy days, and many of the Sabbath regulations); but a similar decision was not so easy in the case of the Biblical statutory insistences. The researches of more recent years in the domainof Biblical literature have enabled the successors of these earlier Reformers to apply to the Bible and Pentateuch the principles applied by their predecessors to rabbinical literature. The Pentateuch is not the work of one period. Pentateuchal legislation also is the slow accretion of centuries. The original content of Judaism does not consist in the Law and its institutions, but in the ethical monotheism of the Prophets. Legalism is, according to this view, originally foreign to Judaism. It is an adaptation of observances found in all religions, and which therefore are not originally or specifically Jewish. The legalism of Ezra had the intention and the effect of separating Israel from the world. This separatism is to-day a hindrance, not a help, to the carrying out of the Jewish mission. The Jew must seek the world in order to make his ethical religion a vital influence therein. The Pentateuchal ordinances are binding upon the Jew in no higher degree than the Talmudic. But this new school—commonly designated as the Radical—adopts also, though in a new form, Samuel Hirsch's theory of the symbolic value of the ceremonial element. It invokes the psychological factor as finally decisive. Certain laws and institutions have in course of time, and owing to bitter persecutions, taken on a new significance. They have come to be associated in the Jewish consciousness with Jewish loyalty unto death in the face of apostasy and prejudice and oppression. Circumcision, the Sabbath, and the dietary laws (see Bib. Book of Daniel) may be said to comprise this class of institutions. The former two, even in Radical congregations and in the life of their individual members, have retained their hold on the religious conciousness. The seventh-day Sabbath, though observed only in theory, is still regarded as the one citadel which must not be reconstructed. It is proclaimed the visible sign of Israel's unity. Congregations that would officially substitute the first day for the seventh as the Sabbath would be called schismatic. The dietary laws have had their own history in Reform thought. A committee was appointed at the Breslau conference to report on them; but as the conference never again convened, only the suggestions of some of the members appeared in print. The more conservative opinions were in favor of reverting to Biblical practise, recognizing that the rabbinical insistence on a certain mode of slaughtering, and Talmudic interpretations of "ṭerefah," of "meat and milk," etc., are without Biblical warrant (see Wiener, "Die Jüdischen Speisegesetze," pp. 482 et seq.). In the United States the Biblical equally with the Talmudic dietary laws have fallen generally into disuse, even in so-called conservative congregations, though no rabbinical conclave or synod ever sanctioned or suggested this. On the principle, fundamental to Jewish Reform, that the national exclusiveness of Judaism is no longer its destiny, these practises, necessarily resulting in Jewish separatism and incorporated into the Levitical scheme to effect Levitical purity, must be looked upon as in one class with all other sacerdotal and Levitically national provisions. Reform Judaism withal does not reduce Judaism to a religion of creed, least of all to a religion of salvation, with the prospect of heavenly rewards or life everlasting for the pious believer. In saying that Judaism is a mission to keep alive among men the consciousness of man's godlikeness, Reform Judaism holds that Judaism is imposed on the Jew by birth. It is not accepted by him in a voluntary act of confession. The Jew by his life and example is called to demonstrate the perfectibility—over against the Paulinian dogma of the total depravity—of every human being, and to help to render conditions on earth more and more perfect. Insistence on justice and righteousness are the practical postulate of the Jew's ethical monotheism, which is never a more belief, but always a vitalizing principle of conduct. This duty of being an exemplar to others, incumbent on the Jew by virtue of his historical descent from prophetic ancestors on whose lips this monotheism was first formulated, at times entails suffering and always requires fortitude; but it is imposed in the certainty that ultimately justice and righteousness will triumph on earth, and all men will learn to know God and live the life which those who know God must live. With this Messianic fulfilment the history of the Jew will attain its goal. (1) The world and humanity are under the guidance of God, who reveals Himself to man in history as the Supreme Power unto Righteousness, as the Educator and Father of His children, the whole human family. The anthropomorphic character of the theological terminology is fully recognized. (2) In His grace and wisdom God has appointed Israel to be His witness on earth, laying upon this His priest-people the obligation by its life to lead the world to the recognition of the truth that love and justice and righteousness are the only principles of conduct which can establish peace among men and fill man's life with blissful harmony, besides conferring on man an imperturbable sense of worth and worthiness, independent of accidents of fortune or station. (3) This election of Israel confers no privilege on the Jew, but imposes greater obligations. Every human being is God's child, called to lead and capable of leading a righteous life. (4) The dispersion of the Jews and the destruction of the Temple were not acts of providential requital for sins. They were providential devices to bring Israel nearer unto other children of man. The goal of Israel's history is not national restoration and segregation, but the rise of a more nearly perfect humanity in which Jewish love for God and man shall be universalized. Not a Messiah, but the Messianic age, is the burden of Israel's hope. (5) Like all Judaism, Reform rejects the doctrine of man's innate sinfulness. The Law—which according to Paul is a means to arouse a consciousness of the futility of man's attempt to conquer sin and is thus expressive of Judaism's content as merely preliminary—is not Judaism's distinctive badge orpossession. The Law, often of non-Jewish origin, is the product of time, and is subject to growth and change in the course of time. But Judaism is a body of spiritual and moral truths, and as such independent of legal expression or enactment. Circumcision is not, like baptism, an indispensable and prerequisite rite of reception. Born of a Jewish mother, the Jew is Jew by birth (see Proselyte). As Israel is not now, and is not necessarily destined again to be, a political nation on the soil of Palestine, there are omitted all references not only to Palestine as the only legitimate home of Judaism and to the sacerdotal and sacrificial Temple services and laws, but also to the laws and institutions that are bound up with social conditions no longer extant and not expected to become reactive (in Palestine) in the future. For example, the Levirate and ḤaliẒah, not being applicable to our times and conditions, are abolished as having lost binding force. The laws regulating marriage and divorce, as developed more especially in Talmudic casuistry, often operate unjustly (see Get) and are, in view of the better provisions in the civil codes of modern nations, amended and in many respects superseded by the law of the land (see Monogamy). Woman is no longer deemed to be a minor, but is admitted to full participation in the religious life of the congregation. As far as possible, Reform Judaism endeavors to preserve the historical continuity with the past, especially in its ritual and synagogal services. The best illustration of this is afforded by Einhorn's prayer-book "'Olat Tamid" (see Einhorn, David). This is based on Zunz's researches into the rise and development of the Jewish ritual. It omits the Musaf, as essentially sacrificial. Allusions in the older forms of the prayers to the Messiah are changed into expressions of hope in the Messianic destiny of Israel and of all mankind. For the doctrine of resurrection is substituted that of God's sustaining love. Otherwise, the scheme is maintained as it was in the synagogues of the tannaitic period, the service on Yom ha-Kippurim alone showing departures of greater scope from the traditional pattern, the piyyuṭim being largely replaced by paraphrases of the Psalms illustrative of the Jewish conceptions of sin, repentance, and atonement. The Yom ha-Kippurim itself is treated as typical of the ultimate Messianic fulfilment. The service for the Ninth of Ab ("Tish'ah be-Ab") is especially noteworthy. It is a résumé, in fact, of the Reform construction of Israel's history and Messianic obligations. The Hebrew language is retained in the prayers that are of tannaitic origin—e.g., Shema' with its berakot, and Shemoneh 'Esreh. Some minor points resulting from the application of the foregoing principles, in which the practise of the Reform synagogues differs widely from the traditional, should be noticed. In public and private prayers the use of the vernacular language predominates. For this there is good historical precedent (Yer. Soṭah vii. 1). R. Jose, controverting the prohibition of the use of any language but Hebrew (Soṭah vii. 1, 33a; Yer. Soṭah iii. 1), permits the recitation of the Shema', the Decalogue, the "Tefillah" ("Shemoneh 'Esreh"), and grace after meals in any language understood by the worshiper (comp. Maimonides, "Yad," Ḳeri'at Shema', ii. 10; Shulḥan 'Aruk, Oraḥ Ḥayyim, 62, 2; 102, 4). Einhorn, followed in the main by the Union Prayer-Book (see Prayer-Books), retains the Hebrew for the mishnaic prayers, and, strange to say, the Aramaic for the Ḳaddish where the original is in the vernacular of its day. The Ḳaddish in America has become a prayer in memory of the dead, though this perversion of its meaning is not countenanced by all. 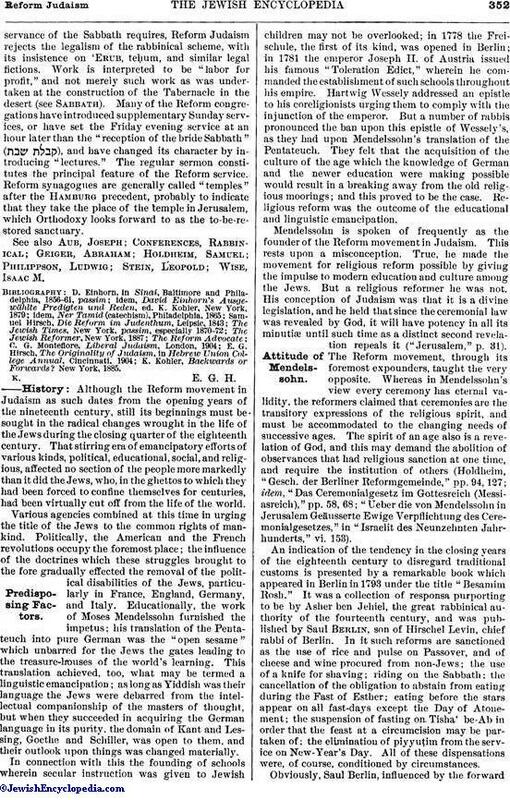 The Reformgenossenachaft of Berlin omitted Hebrew almost entirely; but even in the most radical congregations of America such portions as the Bareku, the Shema', and the Ḳadosh (See Ḳedushshah) are recited in Hebrew. In the reading of the Law the triennial cycle was adopted, though of late most congregations have reverted to the annual one—reading, however, only a small portion of each "parashah," which results in the Torah being read in disjointed fragments. The scheme of the Union Prayer-Book ignores both the annual and the triennial cycle. The "calling up" of the prescribed number of men is omitted, the reader reciting the benedictions before and after and reading the portion without interruption. The trope (see Jew. Encyc. iii. 537b, s.v. Cantillation) also has been abandoned. Ṭallit and tefillin (see Phylacteries) are not worn; neither is the "kittel" (see Sargenes) on the Day of Atonement; nor are the shoes removed on that day. Worship is engaged in with uncovered head. For this latter concession to Occidental custom there seems to have been a precedent in the habits of the Jews in France in the thirteenth century (see Isserles, "Darke Mosheh." on Ṭur Oraḥ Ḥayyim, 282, ; and "Ha-Manhig," ed. Berlin, p. 15, where the covered head is called the "custom of Spain," from which it is plain that in Provence, the country of Abraham b. Nathan ha-Yarḥi, the author of the "Manhig," the uncovered head was the rule). In Reform synagogues the Organ and mixed choirs are always among the appointments of public worship. In Germany the gallery for women is without curtain or lattice-work to hide its occupants from view; while in America the segregation of the sexes has been abandoned in favor of family pews. Women no longer regard it as a religious duty to clip or to cover up their hair. The Almemar is connected with the Ark. The observance of the second days of the holy days (see Festivals) has been discontinued, as there is at present no uncertainty concerning the proper day. Minyan is not determined by the presence of ten men. The Dukan of the priests is abolished, since the privileges of priest and Levite are sacerdotal and thus bound up with nationlism. The priestly benediction is recited by the reader with reading changed from "Aaron and his sons, the priests, Thy holy people" to "Aaron and his sons, the priests of Thy holy people" (from to ). In the understanding of what the proper observanceof the Sabbath requires, Reform Judaism rejects the legalism of the rabbinical scheme, with its insistence on 'Erub, teḥum, and similar legal fictions. Work is interpreted to be "labor for profit," and not merely such work as was undertaken at the construction of the Tabernacle in the desert (see Sabbath). Many of the Reform congregations have introduced supplementary Sunday services, or have set the Friday evening service at an hour latter than the "reception of the bride Sabbath" ( ), and have changed its character by introducing "lectures." The regular sermon constitutes the principal feature of the Reform service. Reform synagogues are generally called "temples" after the Hamburg, precedent, probably to indicate that they take the place of the temple in Jerusalem, which Orthodoxy looks forward to as the to-be-restored sanctuary. See also Aub, Joseph; Conferences, Rabbinical; Geiger, Abraham; Holdheim, Samuel; Philippson, Ludwig; Stein, Leopold; Wise, Isaac M.
K. Kohler, Backwards or Forwards? New York, 1885. Although the Reform movement in Judaism as such dates from the opening years of the nineteenth century, still its beginnings must be sought in the radical changes wrought in the life of the Jews during the closing quarter of the eighteenth century. That stirring era of emancipatory efforts of various kinds, political, educational, social, and religious, affected no section of the people more markedly than it did the Jews, who, in the ghettos to which they had been forced to confine themselves for centuries, had been virtually cut off from the life of the world. Various agencies combined at this time in urging the title of the Jews to the common rights of mankind. Politically, the American and the French revolutions occupy the foremost place; the influence of the doctrines which these struggles brought to the fore gradually effected the removal of the political disabilities of the Jews, particularly in France, England, Germany, and Italy. Educationally, the work of Moses Mendelssohn furnished the impetus; his translation of the Pentateuch into pure German was the "open sesame" which unbarred for the Jews the gates leading to the treasure-houses of the world's learning. 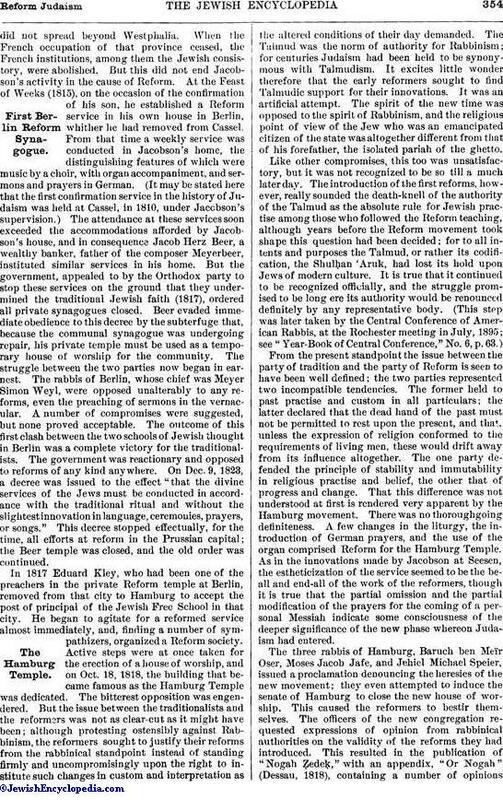 This translation achieved, too, what may be termed a linguistic emancipation; as long as Yiddish was their language the Jews were debarred from the intellectual companionship of the masters of thought, but when they succeeded in acquiring the German language in its purity, the domain of Kant and Lessing, Goethe and Schiller, was open to them, and their outlook upon things was changed materially. In connection with this the founding of schools wherin secular instruction was given to Jewish children may not be overlooked; in 1778 the Freischule, the first of its kind, was opened in Berlin; in 1781 the emperor Joseph II. of Austria issued his famous "Toleration Edict," wherein he commanded the establishment of such schools throughout his empire. Hartwig Wessely addressed an epistle to his coreligionists urging them to comply with the injunction of the emperor. But a number of rabbis pronounced the ban upon this epistle of Wessely's, as they had upon Mendelssohn's translation of the Pentateuch. They felt that the acquisition of the culture of the age which the knowledge of German and the newer education were making possible would result in a breaking away from the old religious moorings; and this proved to be the case. Religious reform was the outcome of the educational and linguistic emancipation. Mendelssohn is spoken of frequently as the founder of the Reform movement in Judaism. This rests upon a misconception. True, he made the movement for religious reform possible by giving the impulse to modern education and culture among the Jews. But a religious reformer he was not. His conception of Judaism was that it is a divine legislation, and he held that since the ceremonial law was revealed by God, it will have potency in all its minutiæ until such time as a distinct second revelation repeals it ("Jerusalem", p. 31). The Reform movement, through its foremost expounders, taught the very opposite. Whereas in Mendelssohn's view every ceremony has eternal validity, the reformers claimed that ceremonies are the transitory expressions of the religious spirit, and must be accommodated to the changing needs of successive ages. The spirit of an age also is a revelation of God, and this may demand the abolition of observances that had religious sanction at one time, and require the institution of others (Holdheim, "Gesch. der Berliner Reformgemeinde," pp. 94, 127; idem, "Das Ceremonialgesetz im Gottesreich (Messiasreich)," pp. 58, 68; "Ueber die von Mendelssohn in Jerusalem Geäusserte Ewige Verpflichtung des Ceremonialgesetzes," in "Israelit des Neunzehnten Jahrhunderts," vi. 153). An indication of the tendency in the closing years of the eighteenth century to disregard traditional customs is presented by a remarkable book which appeared in Berlin in 1793 under the title "Besamim Rosh." It was a collection of responsa purporting to be by Asher ben Jehiel, the great rabbinical authority of the fourteenth century, and was published by Saul Berlin, son of Hirschel Levin, chief rabbi of Berlin. In it such reforms are sanctioned as the use of rice and pulse on Passover, and of cheese and wine procured from non-Jews; the use of a knife for shaving; riding on the Sabbath; the cancellation of the obligation to abstain from eating during the Fast of Esther; eating before the stars appear on all fast-days except the Day of Atonement; the suspension of fasting on Tisha' be-Ab in order that the feast at a circumcision may be partaken of; the elimination of piyyuṭim from the service on New-Year's Day. All of these dispensations were, of course, conditioned by circumstances. Obviously, Saul Berlin, influenced by the forwardtendencies of his age, wrote these responsa and ascribed them to Asher ben Jehiel, not daring to advocate such reforms in his own name, but hoping to obtain sanction for them by crediting them to a paladin of Rabbinism. The book and the author were assailed by Marcus Benedict, the chief rabbi of Moravia, who denounced the production as spurious; and it was defended as zealously by Hirschel Levin, the father of Saul Berlin. A letter addressed by this Levin to the Berlin congregation throws a most interesting light upon conditions at this critical juncture, when the old Judaism was struggling to retain its hold and the new had not yet made its appearance. The old rabbi recognized that changes were impending; Judaism seemed to him in great danger and to be nearing dissolution. Because of this distressing condition of affairs he stated in his letter that he desired to resign his office and end his days in the Holy Land, since he could not endure any longer to witness the decay of religious life among his people. From expressions like this it becomes evident that many Jews had ceased to conform to rabbinical practise. There was a conflict between the traditional interpretation of the faith and the larger life the people were leading. Partaking of the philosophical and literary culture of the time, numbers failed to find religious satisfaction in the observance of many forms, customs, and ceremonies which had been accepted unquestioningly by their fathers as constituting an essential element of the faith. The old Berlin rabbi, and such as he, knew but one rule for the Jew, and that was the faithful observance cf every item of religious practise as codified in the Shulḥan 'Aruk. About him, however, were hundreds upon whom this obligation sat lightly, or who disregarded utterly many an injunction that he considered of supreme importance. But although change was in the air, the eighteenth century witnessed only one practical demonstration of the working of the new spirit; and this occurred not in Germany, but in Holland. In 1796, after great agitation, a congregation was organized in Amsterdam under the name of "Adath Jeshurun," whose avowed purpose was to introduce certain reforms; but the results were painfully inadequate: they consisted merely in the abolition of some piyyuṭim wherewith the synagogal service had become overburdened, and the use of the vernacular in public addresses. In as far as any one individual can be credited with being the pioneer of the movement for introducing reforms into the Synagogue, that credit belongs to Israel Jacobson. Jacobson noted with distress the indifferent attitude of many Jews toward their faith, for he was deeply attached to his ancestral religion; he came to the conclusion that this indifference was due to the fact that Judaism had degenerated into a lifeless formalism which could not possibly appeal to such as regarded religion as the depositary of spiritual truths. Form and ceremony had usurped the place of the essentials. The services in the Synagogue were unintelligible, and the disorder and indecorum prevalent there did not tend to further the spirit of devotion. Jacobson became convinced that the only method whereby these abuses could be corrected was the reform of the service. He proceeded cautiously. He began his activity in the cause of Reform by founding a school at Seesen, in which the children were instructed in secular subjects in addition to the Hebrew branches, and a religious service was instituted. Features were introduced at these services which would not have been tolerated in the Synagogue, such as songs and sermons in the vernacular. These services were attended frequently by adults who, becoming accustomed to hearing the German language at a religious service, were readily enlisted in the cause when the time came for inaugurating reforms in the house of worship; and when the children who attended this and similar schools grew to maturity, they likewise became hearty supporters of the new movement. But Jacobson's real opportunity did not come until the time of the French occupation of Westphalia. On March 31, 1808, a Jewish consistory was established in that province after the French model, and Jacobson was named president. Determining to use his position to carry his Reform ideas into practise, he induced his colleagues to found at Cassel a school similar to that at Seesen. A place of worship was built in connection with the school, and every Sabbath services were conducted partly in Hebrew and partly in German; a member of the consistory (which was made up of the president, three rabbis, and two laymen) preached a sermon in the vernacular, and German songs were sung. The rabbinical members of the consistory took pains to explain that these reforms were not antagonistic to any traditional rabbinical enactments. The success of this departure encouraged Jacobson to take a bolder step. At his own expense he erected a temple at Seesen, placing in it an organ, and forming a choir from among the pupils of the school. This, the first Reform temple, was dedicated with elaborate ceremonies on July 17, 1810. The occasion was described bombastically as the "festival of the Jewish Reformation." Jacobson was lauded extravagantly by sympathizers of the movement as the regenerator of Judaism. He took these praises seriously. He really thought that the religious ills that had been corroding the very vitals of Judaism were now removed. But the evil was beyond his power to fathom. The reforms wherewith his name is associated were purely external. He did what he could, according to his light; but he did not penetrate to the seat of the distemper that was playing such havoc with the inherited traditions. 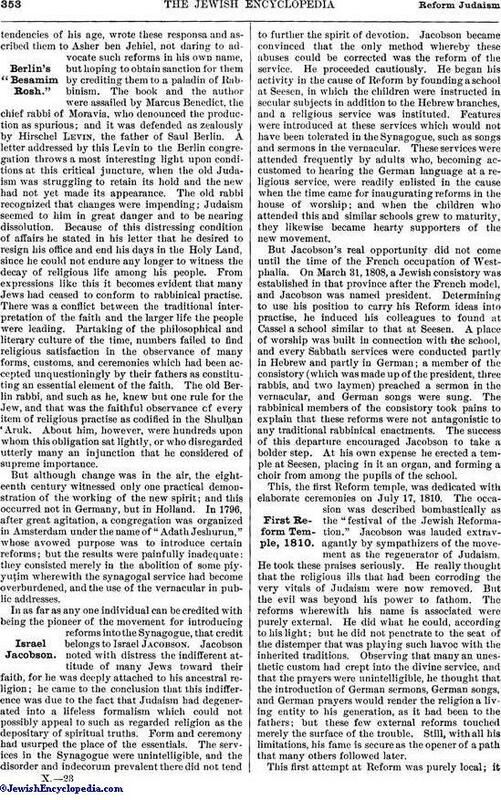 Observing that many an unesthetic custom had crept into the divine service, and that the prayers were unintelligible, he thought that the introduction of German sermons, German songs, and German prayers would render the religion a living entity to his generation, as it had been to the fathers; but these few external reforms touched merely the surface of the trouble. Still, with all his limitations, his fame is secure as the opener of a path that many others followed later. This first attempt at Reform was purely local; itdid not spread beyond Westphalia. When the French occupation of that province ceased, the French institutions, among them the Jewish consistory, were abolished. But this did not end Jacobson's activity in the cause of Reform. At the Feast of Weeks (1815), on the occasion of the confirmation of his son, he established a Reform service in his own house in Berlin, whither he had removed from Cassel. From that time a weekly service was conducted in Jacobson's home, the distinguishing features of which were music by a choir, with organ accompaniment, and sermons and prayers in German. (It may be stated here that the first confirmation service in the history of Judaism was held at Cassel, in 1810, under Jacobson's supervision.) The attendance at these services soon exceeded the accommodations afforded by Jacobson's house, and in consequence Jacob Herz Beer, a wealthy banker, father of the composer Meyerbeer, instituted similar services in his home. But the government, appealed to by the Orthodox party to stop these services on the ground that they undermined the traditional Jewish faith (1817), ordered all private synagogues closed. Beer evaded immediate obedience to this decree by the subterfuge that, because the communal synagogue was undergoing repair, his private temple must be used as a temporary house of worship for the community. The struggle between the two parties now began in earnest. The rabbis of Berlin, whose chief was Meyer Simon Weyl, were opposed unalterably to any reforms, even the preaching of sermons in the vernacular. A number of compromises were suggested, but none proved acceptable. The outcome of this first clash between the two schools of Jewish thought in Berlin was a complete victory for the traditionalists. The government was reactionary and opposed to reforms of any kind anywhere. 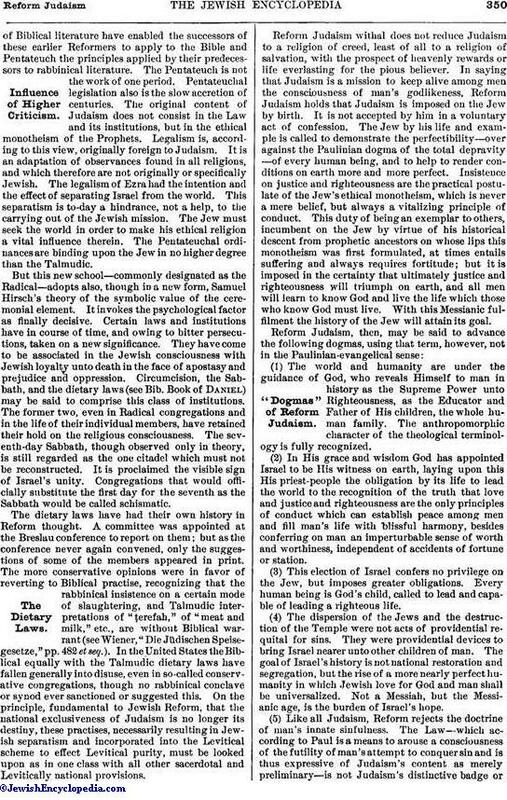 On Dec. 9, 1823, a decree was issued to the effect "that the divine services of the Jews must be conducted in accordance with the traditional ritual and without the slightest innovation in language, ceremonies, prayers, or songs." This decree stopped effectually, for the time, all efforts at reform in the Prussian capital; the Beer temple was closed, and the old order was continued. In 1817 Eduard Kley, who had been one of the preachers in the private Reform temple at Berlin, removed from that city to Hamburg to accept the post of principal of the Jewish Free School in that city. He began to agitate for a reformed service almost immediately, and, finding a number of sympathizers, organized a Reform society. Active steps were at once taken for the erection of a house of worship, and on Oct. 18, 1818, the building that became famous as the Hamburg Temple was dedicated. The bitterest opposition was engendered. But the issue between the traditionalists and the reformers was not as clear-cut as it might have been; although protesting ostensibly against Rabbinism, the reformers sought to justify their reforms from the rabbinical standpoint instead of standing firmly and uncompromisingly upon the right to institute such changes in custom and interpretation as the altered conditions of their day demanded. The Talmud was the norm of authority for Rabbinism; for centuries Judaism had been held to be synonymous with Talmudism. It excites little wonder therefore that the early reformers sought to find Talmudic support for their innovations. It was an artificial attempt. The spirit of the new time was opposed to the spirit of Rabbinism, and the religious point of view of the Jew who was an emancipated citizen of the state was altogether different from that of his forefather, the isolated pariah of the ghetto. From the present standpoint the issue between the party of tradition and the party of Reform is seen to have been well defined; the two parties represented two incompatible tendencies. The former held to past practise and custom in all particulars; the latter declared that the dead hand of the past must not be permitted to rest upon the present, and that, unless the expression of religion conformed to the requirements of living men, these would drift away from its influence altogether. The one party defended the principle of stability and immutability in religious practise and belief, the other that of progress and change. That this difference was not understood at first is rendered very apparent by the Hamburg movement. There was no thoroughgoing definiteness. A few changes in the liturgy, the introduction of German prayers, and the use of the organ comprised Reform for the Hamburg Temple. 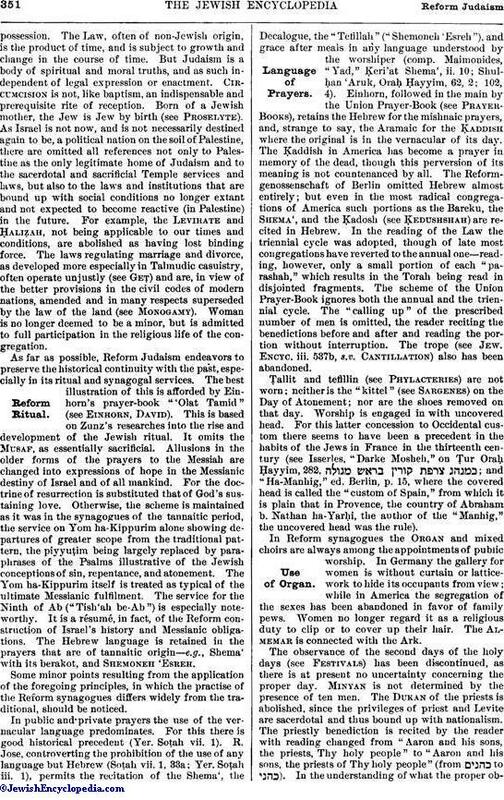 As in the innovations made by Jacobson at Seesen, the estheticization of the service seemed to be the be-all and end-all of the work of the reformers, though it is true that the partial omission and the partial modification of the prayers for the coming of a personal Messiah indicate some consciousness of the deeper significance of the new phase whereon Judaism had entered. The three rabbis of Hamburg, Baruch ben Meïr Oser, Moses Jacob Jafe, and Jehiel Michael Speier, issued a proclamation denouncing the heresies of the new movement; they even attempted to induce the senate of Hamburg to close the new house of worship. This caused the reformers to bestir themselves. The officers of the new congregation requested expressions of opinion from rabbinical authorities on the validity of the reforms they had introduced. This resulted in the publication of "Nogah Ẓedeḳ," with an appendix. "Or Nogah" (Dessau, 1818), containing a number of opinionsfavorable to the new departure. The rabbis of Hamburg appealed also to their colleagues for support in the stand they had taken. They received twenty-two responsa ("Eleh Dibre ha-Berit," Altona, 1819), all approving the position taken by the rabbis of Hamburg and violently denouncing the reformers. These condemnatory opinions had no practical result. The Orthodox party did not succeed in having the temple closed by the government. Shortly after the dedication Gotthold Salomon was called from Dessau to fill the office of preacher in conjunction with Eduard Kley. In 1820 the Hamburg reformers established a branch synagogue at Leipsic, where services were conducted during the great yearly fairs. Merchants from all over Europe gathered at these fairs, and the ideas expressed in sermons preached in the Reform synagogue were spread through many distant communities, and frequently became an incentive to work along the lines of Reform. I. L. Auerbach of Berlin was the preacher of this cosmopolitan congregation. During the third, fourth, and fifth decades of the nineteenth century many congregations in Germany. Austria, Hungary, France, and Denmark introduced reforms to a greater or less extent. These reforms were usually in the direction of greater decorum, fewer piyyuṭim, music by a regular choir, and sermons in the vernacular. Such was the so-called Vienna program, which was adopted by the congregation of the Austrian capital under the guidance of its preacher, Isaac Noah Mannheimer, and its cantor, Solomon Sulzer. Confirmation was introduced quite generally. A number of governmental edicts were issued during these years containing instructions to the heads of the Jewish communities to remove the abuses which had crept into the synagogues and to introduce reforms; among such edicts may be mentioned those of Saxe-Weimar (1823), Anhalt (1835), Hanover (1837), Baden (1838), Middle Franconia and Saxe-Meiningen (1839). Abraham Geiger had been elected rabbi of Wiesbaden in 1832; in 1835 he began the publication of his "Wissenschaftliche Zeitschrift für Jüdische Theologic," through which he exerted great influence as a leader of Reform; in 1837 he called a rabbinical conference, which met at Wiesbaden, but had no practical result. In 1838 the Jewish community of Breslau determined to appoint a rabbi who belonged to the new school as a colleague of S. A. Tiktin, who had served the community since 1821 and was a representative of the old school. Abraham Geiger was appointed, but Tiktin had no sympathy with the feeling that actuated his congregation, and therefore he did all in his power to prevent Geiger's coming to Breslau. A discreditable campaign of abuse was directed against Geiger by Tiktin's followers. They hoped to make his acceptance of the position impossible by inducing the Prussian government to withhold from him the naturalization papers necessary before he could enter upon the position to which he had been elected. They entered all kinds of accusations against his religious soundness, and he was compelled to remove to Berlin in order to give his whole time and attention to the matter. After fifteen months he succeeded in securing his naturalization papers; he preached his inaugural sermon as rabbi of Breslau on Jan. 4, 1840, when he used these words: "Judaism is not a finished tale; there is much in its present form that must be changed or abolished; it can assume a better and higher position in the world only if it will rejuvenate itself; all should unite in this work." Geiger displayed great activity, preaching in the vernacular, instituting classes for the young, and delivering lectures on Jewish history and literature. Tiktin refused to recognize him as a colleague. The situation in the community becoming intolerable, it was suggested that there be a separation of functions, that Tiktin be recognized as the rabbi, with jurisdiction in all cases which required rabbinical decisions, and that Geiger act merely as the preacher. To this Geiger would not consent. The relations between the two became so strained that the governing board of the congregation was forced to suspend Tiktin from office. In order to fortify himself in his position Tiktin had addressed various rabbis of Upper Silesia for an expression of opinion, all of whom agreed with him. In June, 1842, he issued a pamphlet entitled "Darstellung des Sachverhältnisses in Seiner Hiesigen Rabbinatsangelegenheit," in which he included some of the responsa he had received. This constituted an appeal to the larger Jewish world and advanced the controversy beyond the local stage. Tiktin and his colleagues stated their position clearly and unmistakably. They read Geiger and all who thought as he did out of Judaism and declared for the inspiration of the Talmud. According to these rabbis, Judaism was a fixed and practically immutable system. Tiktin accused the governing board of the congregation of having "selected a dayyan who in spoken and written discourse denies unreservedly the authoritative validity of traditional Judaism, and whose call and mission appear to be to extirpate it root and branch for all time." This placed the governing board upon the defensive; it therefore determined to call for the opinions of well-known rabbis as to the justice of the claims of the Tiktin party. It received seventeen replies, which were published in two volumes under the title "Rabbinische Gutachten über die Vertrüglichkeit der Freien Forschung mit dem Rabbineramte." These rabbis were unanimous in the opinion that freedom of thought is compatible with the exercise of rabbinical functions, and they condemned Tiktin and his sympathizers for the attitude they had assumed. The board accordingly addressed a letter of confidence to Geiger; but the bitter feelings that had been engendered were not removed. Even the death of Tiktin, in March, 1843, did not end the conflict. The opposition, being certain that Geiger would be elected chief rabbi, resolved to form a new congregation. Affairs were growing increasingly unpleasant in the community, and the government was invited to interfere; a rescript was issued ordering that Geiger be the chief rabbi, that a second rabbi be elected, that there be no split in the congregation, and that thereafter the government be not called upon to settle the internal controversies of the Jewish community. Geiger wasestablished firmly in his position, and the cause of Reform had achieved a decided victory. In 1842 the Hamburg Temple again became the storm-center. In 1839 a committee had been appointed to revise the prayer-book used by the congregation. 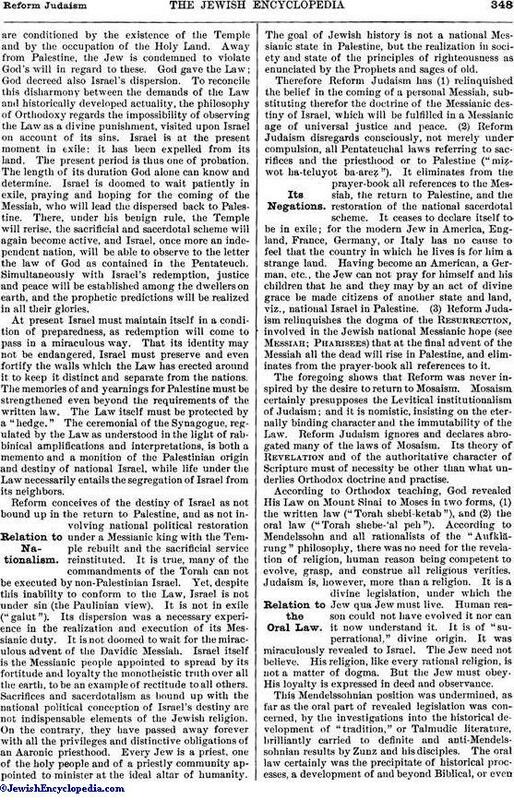 The publication of the revised edition in 1841 called forth from Isaac Bernays, the ecclesiastical chief of the Orthodox community, a proclamation ("moda'ah") warning all Israelites not to use the book and declaring that any one doing so would fall short in his duty as a Jew. This brought forth a counter declaration from the Temple officers rebuking Bernays for his presumption. Both these documents were ordered removed from the synagogues by the senate of the city. Bernays then issued a caution ("azharah"): "It is forbidden to pray the obligatory prayers and benedictions from the book entitled 'Prayers for Israelites.' which appeared here during the past year." This unprecedented action of Bernays caused such a commotion that the Temple directorate found it necessary to secure from accredited theological authorities opinions in regard to the prayer-book. Twelve rabbis of high standing responded, and their opinions were published in a volume entitled "Theologische Gutachten über das Gebetbuch nach dem Gebrauche des Neuen Israelitischen Tempelvereins zu Humburg." All the writers, from the conservative Isaac N. Mannheimer to the radical Holdheim, condemned Bernays' action, and declared that the prayer-book was permeated with the spirit of Judaism and that any one who prayed from it performed his full duty as a Jew. In 1836 several members of the Ancient Synagogue of Spanish and Portuguese Jews (Bevis Marks) of London petitioned the Mahamad to introduce into the service "such alterations and modifications as were in the line of the changes introduced in the Reform synagogue in Hamburg and other places." This petition caused the elders to take steps to insure greater decorum at the services. This, however, did not satisfy the reformers. They petitioned a second time in 1839; the reforms which they advocated were a diminution in the length and number of prayers, a more convenient hour of service on Sabbaths and holy days, sermons in English, a choir, and the abolition of the second days of the holy days. This petition was disregarded. The reformers then took a more decided step; not wishing to sccede from the congregation, they requested permission to erect a branch synagogue in the West End, near their homes, where they might introduce the desired changes while the mother synagogue continued along traditional lines. This was refused on the ground of an "askama" (rule) of the congregation forbidding within a radius of four miles of the synagogue the erection of any house of prayer or the holding of any service not of a domestic nature. This forced the reformers to organize an independent congregation, which was done at a meeting held April 15, 1840. The new congregation was to be called the West London Synagogue of British Jews. In a communication addressed by the organizers of the new congregation to the elders of the Bevis Marks Synagogue, on Aug. 24, 1841, they announced their intention of opening a new place of worship and of introducing changes and innovations in the ritual. The elders passed a resolution denouncing the movement as schismatic. 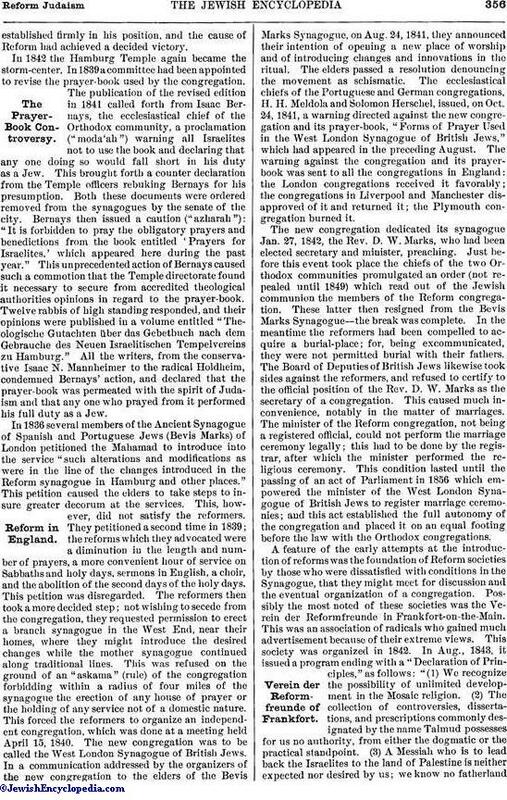 The ecclesiastical chiefs of the Portuguese and German congregations, H. H. Meldola and Solomon Herschel, issued, on Oct. 24, 1841, a warning directed against the new congregation and its prayer-book, "Forms of Prayer Used in the West London Synagogue of British Jews," which had appeared in the preceding August. The warning against the congregation and its prayer-book was sent to all the congregations in England: the London congregations received it favorably; the congregations in Liverpool and Manchester disapproved of it and returned it; the Plymouth congregation burned it. The new congregation dedicated its synagogue Jan. 27, 1842, the Rev. D. W. Marks, who had been elected secretary and minister, preaching. Just before this event took place the chiefs of the two Orthodox communities promulgated an order (not repealed until 1849) which read out of the Jewish communion the members of the Reform congregation. These latter then resigned from the Bevis Marks Synagogue—the break was complete. In the meantime the reformers had been compelled to acquire a burial-place; for, being excommunicated, they were not permitted burial with their fathers. The Board of Deputies of British Jews likewise took sides against the reformers, and refused to certify to the official position of the Rev. D. W. Marks as the secretary of a congregation. This caused much inconvenience, notably in the matter of marriages. The minister of the Reform congregation, not being a registered official, could not perform the marriage ceremony legally; this had to be done by the registrar, after which the minister performed the religious ceremony. This condition lasted until the passing of an act of Parliament in 1856 which empowered the minister of the West London Synagogue of British Jews to register marriage ceremonies; and this act established the full autonomy of the congregation and placed it on an equal footing before the law with the Orthodox congregations. A feature of the early attempts at the introduction of reforms was the foundation of Reform societies by those who were dissatisfied with conditions in the Synagogue, that they might meet for discussion and the eventual organization of a congregation. Possibly the most noted of these societies was the Verein der Reformfreunde in Frankfort-on-the-Main. This was an association of radicals who gained much advertisement because of their extreme views. This society was organized in 1842. In Aug., 1843, it issued a program ending with a "Declaration of Principles," as follows: "(1) We recognize the possibility of unlimited development in the Mosaic religion. (2) The collection of controversies, dissertations, and prescriptions commonly designated by the name Talmud possesses for us no authority, from either the dogmatic or the practical standpoint. (3) A Messiah who is to lead back the Israelites to the land of Palestine is neither expected nor desired by us; we know no fatherlandexcept that to which we belong by birth or citizenship." This declaration called forth severe attacks from all quarters, Orthodox and Reform; men differing as widely in their opinions as David Einhorn and Samuel Hirsch on the one hand, and Michael Sachs and Zacharias Frankel on the other, assailed the destructive tendencies of the society. Einhorn, the reformer, called its declaration of principles a "confession of unbelief"; and Frankel, the conservative, wrote: "the society can not be considered Jewish; it belongs to Judaism as little as to any other religion." Dr. M. A. Stern defended the society in a series of open letters to its critics, letters so bold, so biting, so unsparing, and so sarcastic that they constitute one of the most unique productions of that period of storm and stress in Judaism. It is unlikely, however, that this Frankfort society would have attained such prominence had it not been for the circumcision controversy associated with it. The society at one of its meetings had declared against circumcision as a sine qua non for entrance into Judaism. Just about this time a number of cases of circumcision had resulted fatally, and the sanitary bureau of Frankfort had commanded that the circumcision of Jewish children be placed under the direct supervision of the sanitary office; the same measure ordered that "Israelitish citizens and inhabitants, in so far as they desired to have their children circumcised, should employ only persons who had been appointed especially to perform the rite of circumcision." This was interpreted by some, notably members of the Reform society, to mean that the circumcision of a child was optional with the father. Soon a number of instances occurred in which the rite was dispensed with. The aged rabbi of Frankfort, Solomon Abraham Trier, petitioned the senate of the city to declare that no child of Jewish parentage could be received into the congregation unless it had been circumcised; but the senate refused to pass such a measure. Trier also addressed a communication to eighty European rabbis asking for opinions on the Reform society and on the significance of circumcision. Responses were received from forty-one; twenty-eight were published in a volume entitled "Rabbinische Gutachten über die Beschneidung." All were strongly in favor of circumcision; Samuel Hirsch, the reformer, I. N. Mannheimer, the conservative, and Jacob Aaron Ettlinger, the ultra-Orthodox, clasped hands in agreement upon the point at issue. The result of the agitation was to leave the matter practically where it had been before. The Reform society passed out of public notice soon after the election, in March, 1844, of Leopold Stein, a rabbi of Reform tendencies, as associate to Trier. This appointment was very distasteful to the older rabbi, who refused to acquiesce in the choice of an associate of the new school. He protested to the senate of the city against the election, and the senate referred him to the directorate of the congregation. Trier resigned as rabbi (May, 1844). and Stein began to introduce moderate reforms. Among the most important incidents in the history of Reform are the rabbinical conferences held at Brunswick, Frankfort-on-the-Main, and Breslau, in 1844, 1845, and 1846 (see Conferences, Rabbinical). In the winter of 1844 Dr. Sigismund Stern delivered before the Culture Society of Berlin a course of eight lectures on the subject "The Mission of Judaism and the Jew in the Present." In these lectures he pleaded for some action that would stem the tide of indifference and bring back to the Synagogue the great number who had drifted away because its religious practises and ceremonies had ceased to satisfy them. The outcome of these lectures was the formation of the Genossenschaft für Reform im Judenthum. 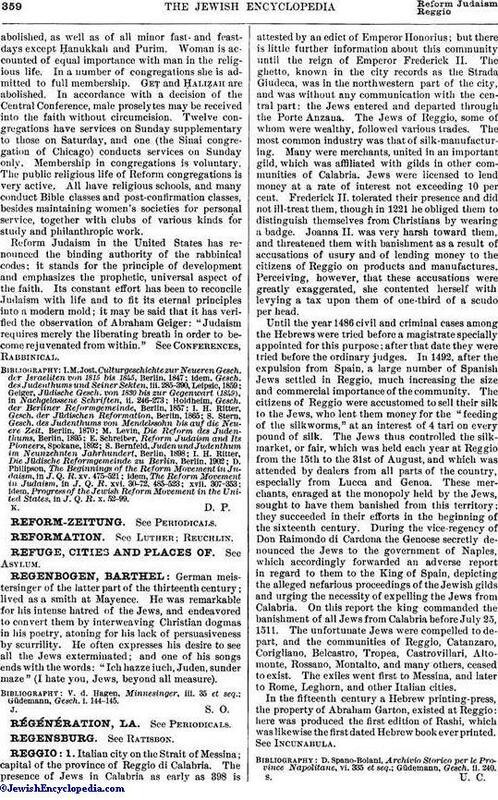 On April 2, 1845, the "Appeal to Our German Coreligionists" appeared, in which the signers, members of the Reform association, called upon the Jews of Germany to cooperate with them in their efforts for Reform. 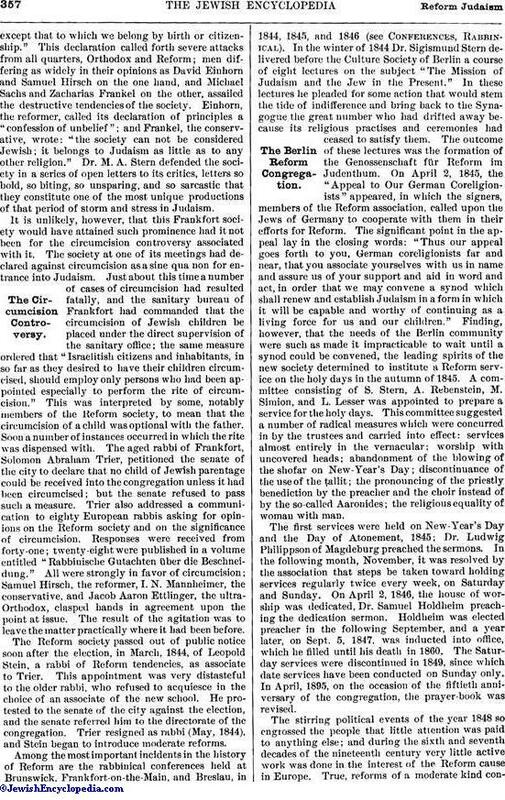 The significant point in the appeal lay in the closing words: "Thus our appeal goes forth to you, German coreligionists far and near, that you associate yourselves with us in name and assure us of your support and aid in word and act, in order that we may convene a synod which shall renew and establish Judaism in a form in which it will be capable and worthy of continuing as a living force for us and our children." Finding, however, that the needs of the Berlin community were such as made it impracticable to wait until a synod could be convened, the leading spirits of the new society determined to institute a Reform service on the holy days in the autumn of 1845. A committee consisting of S. Stern, A. Rebenstein, M. Simion, and L. Lesser was appointed to prepare a service for the holy days. This committee suggested a number of radical measures which were concurred in by the trustees and carried into effect: services almost entirely in the vernacular: worship with uncovered heads; abandonment of the blowing of the shofar on New-Year's Day; discontinuance of the use of the ṭallit; the pronouncing of the priestly benediction by the preacher and the choir instead of by the so-called Aaronides; the religious equality of woman with man. The first services were held on New-Year's Day and the Day of Atonement, 1845; Dr. Ludwig Philippson of Magdeburg preached the sermons. In the following month, November, it was resolved by the association that steps be taken toward holding services regularly twice every week, on Saturday and Sunday. On April 2, 1846, the house of worship was dedicated, Dr. Samuel Holdheim preaching the dedication sermon. Holdheim was elected preacher in the following September, and a year later, on Sept. 5, 1847, was inducted into office, which he filled until his death in 1860. The Saturday services were discontinued in 1849, since which date services have been conducted on Sunday only. In April, 1895, on the occasion of the fiftieth anniversary of the congregation, the prayer-book was revised. The stirring political events of the year 1848 so engrossed the people that little attention was paid to anything else; and during the sixth and seventh decades of the nineteenth century very little active work was done in the interest of the Reform cause in Europe. True, reforms of a moderate kind continuedto be introduced in many congregations, but on the whole a reaction set in, and the conservative temper was much more pronounced than in the years preceding the revolutions of 1848. The first sign of reawakening appeared in 1868, when a rabbinical conference took place at Cassel. This conference, however, accomplished very little; it is notable only because it was in a measure preparatory to the convening of the two synods at Leipsic and Augsburg in 1869 and 1871 (See Synods, Rabbinical). The spread of anti-Semitism during the past three decades seems to have crushed until quite recently all efforts at religious progress in Judaism in western Europe; official Judaism still recognizes the authority of the Shulḥan 'Aruk, although the life of the majority of the people is led in disregard of its provisions. There still exists the very same inconsistency between official Judaism and the life of its professors that in the first half of the nineteenth century led to the rise of the Reform movement. Although Reform failed to realize the expectations of its founders in Europe, it became quite dominant in the United States during the nineteenth century; but before the story of its development in the western hemisphere is recounted a few words must be devoted to a number of independent movements in Europe. In 1845 the Breslau Reform Association was formed along the lines of the Berlin society; it issued a like appeal, and engaged the sympathies of Abraham Geiger, the rabbi of Breslau. Its appeal, however, had no practical results. The congregations of Königsberg and Offenbach instituted a supplementary Sunday service in 1847. In 1848 the Reform Society of Budapest was organized by Ignatz Einhorn and a number of sympathizers; services, with sermon and prayers in the vernacular, were held on Sunday. In 1852 David Einhorn was elected rabbi; but the Orthodox party prevailed upon the government to close the temple, and after a few years of enforced seclusion Einhorn received a call to America. In 1856 the rabbis of France met at the call of M. Ullman, the grand rabbi of Paris, and recommended a number of moderate reforms in the ritual, leaving it, however, to the grand rabbi of each consistory to act upon the recommendation. In England two additional Reform congregations were organized—in Manchester and Bradford. In 1890 a service marked by certain reforms was instituted at Hampstead, near London, by the Rev. Morris Joseph; these services were conducted on Sabbath afternoon and continued for three years. 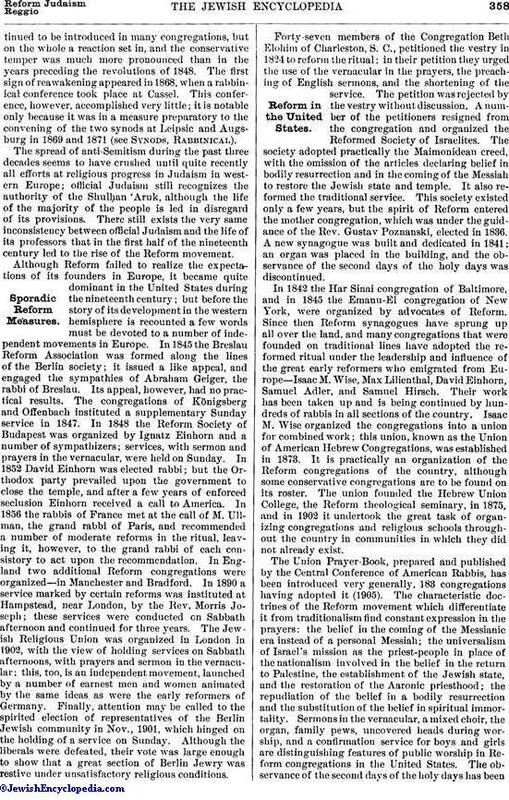 The Jewish Religious Union was organized in London in 1902, with the view of holding services on Sabbath afternoons, with prayers and sermon in the vernacular; this, too, is an independent movement, launched by a number of earnest men and women animated by the same ideas as were the early reformers of Germany. Finally, attention may be called to the spirited election of representatives of the Berlin Jewish community in Nov., 1901, which hinged on the holding of a service on Sunday. Although the liberals were defeated, their vote was large enough to show that a great section of Berlin Jewry was restive under unsatisfactory religious conditions. Forty-seven members of the Congregation Beth Elohim of Charleston, S. C., petitioned the vestry in 1824 to reform the ritual; in their petition they urged the use of the vernacular in the prayers, the preaching of English sermons, and the shortening of the service. The petition was rejected by the vestry without discussion. A number of the petitioners resigned from the congregation and organized the Reformed Society of Israelites. The society adopted practically the Maimonidean creed, with the omission of the articles declaring belief in bodily resurrection and in the coming of the Messiah to restore the Jewish state and temple. It also reformed the traditional service. This society existed only a few years, but the spirit of Reform entered the mother congregation, which was under the guidance of the Rev. Gustav Poznanski, elected in 1836. A new synagogue was built and dedicated in 1841; an organ was placed in the building, and the observance of the second days of the holy days was discontinued. In 1842 the Har Sinai congregation of Baltimore, and in 1845 the Emanu-El congregation of New York, were organized by advocates of Reform. Since then Reform synagogues have sprung up all over the land, and many congregations that were founded on traditional lines have adopted the reformed ritual under the leadership and influence of the great early reformers who emigrated from Europe—Isaac M. Wise, Max Lilienthal, David Einhorn, Samuel Adler, and Samuel Hirsch. Their work has been taken up and is being continued by hundreds of rabbis in all sections of the country. Isaac M. Wise organized the congregations into a union for combined work; this union, known as the Union of American Hebrew Congregations, was established in 1873. It is practically an organization of the Reform congregations of the country, although some conservative congregations are to be found on its roster. The union founded the Hebrew Union College, the Reform theological seminary, in 1875, and in 1902 it undertook the great task of organizing congregations and religious schools throughout the country in communities in which they did not already exist. The Union Prayer-Book, prepared and published by the Central Conference of American Rabbis, has been introduced very generally, 183 congregations having adopted it (1905). The characteristic doctrines of the Reform movement which differentiate it from traditionalism find constant expression in the prayers: the belief in the coming of the Messianic era instead of a personal Messiah; the universalism of Israel's mission as the priest-people in place of the nationalism involved in the belief in the return to Palestine, the establishment of the Jewish state, and the restoration of the Aaronic priesthood; the repudiation of the belief in a bodily resurrection and the substitution of the belief in spiritual immortality. Sermons in the vernacular, a mixed choir, the organ, family pews, uncovered heads during worship, and a confirmation service for boys and girls are distinguishing features of public worship in Reform congregations in the United States. The observance of the second days of the holy days has beenabolished, as well as of all minor fast- and feast-days except Ḥanukkah and Purim. Woman is accounted of equal importance with man in the religious life. In a number of congregations she is admitted to full membership. Geṭ and Ḥaliẓah are abolished. In accordance with a decision of the Central Conference, male proselytes may be received into the faith without circumcision. Twelve congregations have services on Sunday supplementary to those on Saturday, and one (the Sinai congregation of Chicago) conducts services on Sunday only. Membership in congregations is voluntary. The public religious life of Reform congregations is very active. All have religious schools, and many conduct Bible classes and post-confirmation classes, besides maintaining women's societies for personal service, together with clubs of various kinds for study and philanthropic work. Reform Judaism in the United States has renounced the binding authority of the rabbinical codes; it stands for the principle of development and emphasizes the prophetic, universal aspect of the faith. Its constant effort has been to reconcile Judaism with life and to fit its eternal principles into a modern mold; it may be said that it has verified the observation of Abraham Geiger: "Judaism requires merely the liberating breath in order to become rejuvenated from within." See Conferences, Rabbinical. idem, Progress of the Jewish Reform Movement in the United States, in J. Q. R. x. 52-99.